Grand Rapids Natural Health offers Crystal-Free, Diamond Microdermabrasion as an add-on to any facial service for only $20. A Diamond Microdermabrasion session at Grand Rapids Natural Health (photo). What is Microdermabrasion? Microdermabrasion is a procedure that assists in cleansing and removing your top layer of dead skin cells. How it works: A metal tip that is covered with synthetic diamond micro-chips is applied to the skin to polish and help to release the upper layers of dead cells. These dead skin cells are then vacuumed into a waste filter. Did you know that, on average, your skin is composed of 4 to 5 layers of dead skin cells? With age, this can increase to 8+ layers! The thickening of this very top layer of skin causes wrinkles, creates inflexible folds, clogs pores and cannot reflect light. Allows your skincare products to penetrate deeper into your skin. Clears fine lines and prevents wrinkles. Helps your complexion to appear brighter. Why Diamond Microdermabrasion over Crystal Microdermabrasion? By using the metal wand that is covered with micro-chips, the ingestion of aluminum oxide crystals is avoided and you don't have to worry about the crystals getting into your eyes. 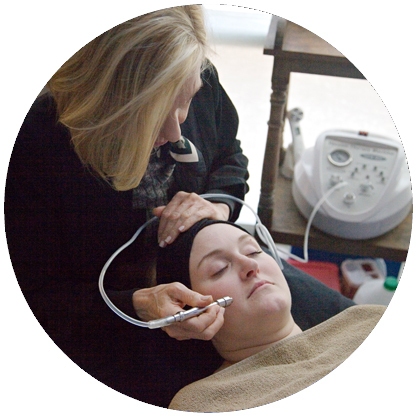 Diamond Microdermabrasion can be added to our KPS Essentials Skincare Services.